Post: Gaurav Akrani. Date: 4/21/2011. No Comments. Label: Management. 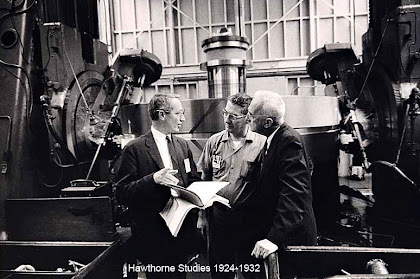 The Human Relations Movement began with the Hawthorne Experiments. They were conducted at Western Electrical Works in USA, b/w 1924-1932. Image Credits © Harvard Business School. These experiments were performed to find out the effect of different levels of illumination (lighting) on productivity of labour. The brightness of the light was increased and decreased to find out the effect on the productivity of the test group. Surprisingly, the productivity increased even when the level of illumination was decreased. It was concluded that factors other than light were also important. Under these test two small groups of six female telephone relay assemblers were selected. Each group was kept in separate rooms. From time to time, changes were made in working hours, rest periods, lunch breaks, etc. They were allowed to choose their own rest periods and to give suggestions. Output increased in both the control rooms. It was concluded that social relationship among workers, participation in decision-making, etc. had a greater effect on productivity than working conditions. 21,000 employees were interviewed over a period of three years to find out reasons for increased productivity. It was concluded that productivity can be increased if workers are allowed to talk freely about matters that are important to them. A group of 14 male workers in the bank wiring room were placed under observation for six months. A worker's pay depended on the performance of the group as a whole. The researchers thought that the efficient workers would put pressure on the less efficient workers to complete the work. However, it was found that the group established its own standards of output, and social pressure was used to achieve the standards of output. The social and psychological factors are responsible for workers' productivity and job satisfaction. Only good physical working conditions are not enough to increase productivity. The informal relations among workers influence the workers' behaviour and performance more than the formal relations in the organisation. Financial incentives alone cannot increase the performance. Social and Psychological needs must also be satisfied in order to increase productivity. Special attention and freedom to express their views will improve the performance of the workers. Lacks Validity : The Hawthorne experiments were conducted under controlled situations. These findings will not work in real setting. The workers under observation knew about the experiments. Therefore, they may have improved their performance only for the experiments. More Importance to Human Aspects : The Hawthorne experiments gives too much importance to human aspects. Human aspects alone cannot improve production. Production also depends on technological and other factors. More Emphasis on Group Decision-making : The Hawthorne experiments placed too much emphasis on group decision-making. In real situation, individual decision-making cannot be totally neglected especially when quick decisions are required and there is no time to consult others. Over Importance to Freedom of Workers : The Hawthorne experiments gives a lot of importance to freedom of the workers. It does not give importance to the constructive role of the supervisors. In reality too much of freedom to the workers can lower down their performance or productivity.